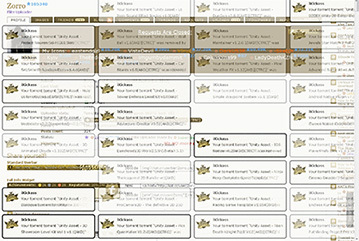 Nearly 2400 torrents got removed from KickassTorrents at a time. The DMCA takedown notices for all these torrents were requested by one company Unity. All the torrents belonged to a single uploader. KickassTorrents has been compatible to DMCA takedown requests. Therefore users can often discover that a torrent they had been looking for is not there anymore. Copyright holders send takedown notices and KAT complies with it. However, today almost 2400 torrents were removed by Unity, which is a game engine organization. The torrents were all uploaded by a single user Zorro. He has got the title of Elite Uploader in the KAT community. In fact, these torrents were taken down in 12 minutes, he claims. All the torrents uploaded by Zorro had content that belonged to Unity, the game asset and engine company. Zorro had some torrents still active besides the ones that got removed, but he deleted the rest himself. Though he and his fans might be sad, he believes to find a new way to share the content. Of course we can understand the point of view from Unity. It’s their content that they have worked hard on, so they wanted it to be taken down. The company has also started with a new strategy. From their website we see they now offer a free option next to Plus, Pro and Enterprise. In fact, the free option does not even need a credit card.